Food on Norwegian Epic is good, and you don't need to splurge on extra-fee dining options if you simply want a tasty meal. Service, on the other hand, can be a touch patchy. Specialty food-lovers can dine out for less by purchasing the Specialty Dining Package, which can be bought online or onboard. Taste and the Manhattan Room are Norwegian Epic's main dining rooms. Taste is open for breakfast, lunch and dinner, while the Manhattan Room is only open for dinner. 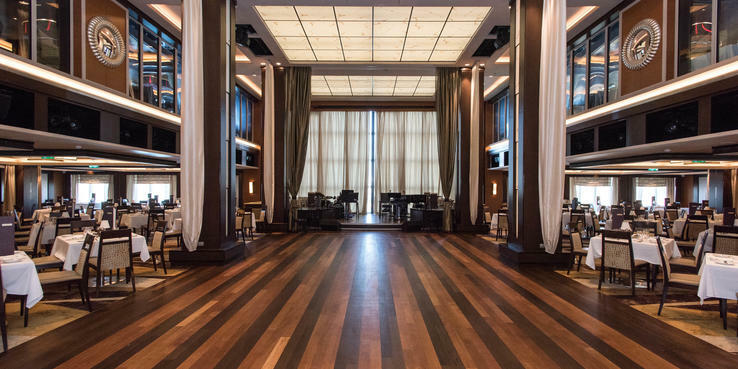 The Manhattan Room has more character than Taste with an Art Deco-inspired New York Supper club feel and a polished dance floor (where professional dancers, rather than passengers, perform three times a week). Both have open seating -- there are no fixed early or late seatings for dinner. Breakfast features everything you'd expect in the morning; if you're heading off on a shore excursion, or time is at a premium, opt for the handy express breakfast. Lunch features a variety of dishes, from soups and salads to burgers and sandwiches. At night, tables are set up for two, four, six or eight people (with larger tables available on request). As there are few two-tops, couples are likely to end up dining with other passengers. The main dinner menu, which is the same in both venues, always features a wide choice of American and international standards, served with a dash of contemporary flair. There is always a vegetarian option. Epic's casual dining buffet is a bright area with great views, a logical layout and plenty of made-to-order food stations. Although the ship was pretty full during our cruise, we never had a problem finding a seat, even if it took a bit of looking around. It's worth the walk to find a quieter spot, particularly in the attractive section that stretches across the front of the vessel. You'll find a full breakfast spread, and a lunch that features all manner of options, including excellent Asian and Indian food sections. Food is clearly marked for vegetarians. Dinner is similarly expansive, and there's always a different culinary theme each night at one of the buffet stations, such as "Taste of Asia" or a Mediterranean extravaganza. O'Sheehan's is always popular and features an emphasis on American favorites and comfort food. It's a nice breakfast alternative to the buffet and dining room but can get busy at lunch and dinner. This bar is the casual sidekick of the adjoining Chinese restaurant of the same name. Seating 15, the venue makes it easy to order: Simply tick the boxes of your choice on the order form, hand it over and wait for the chefs to prepare fresh and tasty noodles, dim sum and stir-fried dishes. This dinner-only restaurant serves a selection of pan-Asian fare. Steps from the Garden Cafe, and almost poolside, is the Great Outdoors. This extension of the main buffet offers easy access to well-spaced tables, tucked under attractive tent-like canopies. On certain days, this adults-only complex offers a lunchtime buffet and from 6 p.m. daily it serves light appetizers. Savor a taste of France in Le Bistro, a high-end formal and intimate dining venue. The large menu lists the dishes in French, with the English translation beneath. Good luck getting to dessert; the appetizers and entrees are rich and filling. Norwegian's signature restaurant is Cagney's Steakhouse, which shares space with Moderno Churrascaria at the back of the ship. There are some fish dishes, but it's not the place for vegetarians. Two words: Go hungry. Across from Cagney's, passadors hauling towering skewers of beef and other carnivore cravings make the rounds at Moderno, an all-you-can-eat meat-fest. Diners are handed a green (for go) chip to put on the table to signal they want more, along with a red chip when they want to halt the feast, perhaps to rustle up some greenery from the large salad buffet. Culinary art is the name of the game at Japanese hibachi eatery Teppanyaki. Cruisers sit around a cooking station while the chef serves up equal amounts of food and theatrical effects, including juggling, jokes, singing and other antics. If Teppanyaki is not your style, then stop off at the 20-seat a la carte sushi and sashimi bar at the entrance and enjoy Japanese delights in more serene surrounds. Accessed via stairs from the Garden Cafe or an elevator close to the aft cabins on Deck 14, this Italian restaurant is tucked out of the way, and a lovely surprise (once you find it). More casual than Le Bistro and Cagney's it, nevertheless, makes for a nice date-night venue.